Dermaplaning, also known as microplaning, is a non-invasive physical exfoliation of the outermost layers of dead skin cells on the face, as well as vellus hair some may refer to as “peach fuzz”. It is performed using a very small but ultra-sharp blade which is gently stroked along the skin at an angle. The result is skin that is softer, smoother, and more responsive to topical skin care regimens afterward (enhanced penetration of skin care products- those placed in the spa and at home), even after one treatment. Clients can benefit even more from subsequent sessions, spaced three to four weeks apart. 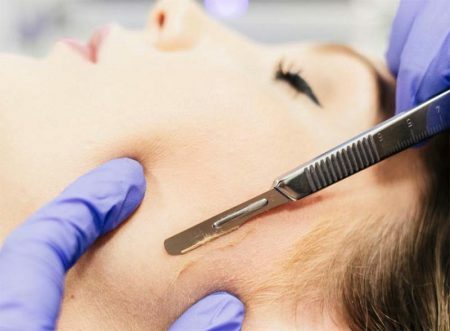 Dermaplaning can be an alternative to chemical peels or microdermabrasion, and may be ideal for patients with extremely sensitive skin, dry skin, and those who also have unwanted facial hair. Contrary to popular belief, when the facial hair grows back it is not any thicker or more coarse than it was prior to the procedure. Some may feel that this can be achieved using a razor at home, but we would discourage that practice as likely to lead to nicks and cuts and rough skin. It should come as no surprise that the quality of the blade on an inexpensive over the counter razor designed for your legs and underarms does not even begin to approach the quality and sharpness of a sterile surgical blade as used during a medical spa Dermaplaning service. The treatment can also be combined with a light chemical peel, for further enhancement of exfoliation, and it can be an “add on” to other types of facials as well. Removal of the stratum corneum (“dead cell layer”), of skin results in smoother, softer feeling skin with reduced pore size and a more radiant complexion. It can reduce the appearance of unwanted pigment, though you may wish to consider our PicoGenesis treatment if sun spots are your primary concern. Dermaplaning is very safe when performed by a specially trained esthetician. At Renew MediSpa our estheticians undergo the most advanced training courses available for the procedures they perform. Removing the peach fuzz is also beneficial since the fine hairs trap debris and oils and give skin a dull look. After dermaplaning, skin care products and treatments perform much more efficiently since they can penetrate the skin more easily. Your makeup goes on smoother as well. Celebrities seem to possess naturally glowing, smooth as silk skin, lustrous hair, and wide-awake eyes—partly because one might suspect they have won the “genetic lottery”, partly due to their skilled makeup artists and hair stylists, and partly because of some very well-kept industry secrets! Dermaplaning is one of those secrets—and chances are, even if you haven’t heard of it, you’ve seen the results. Dermaplaning along with the V Carbon Luxury Purifying Mask! If you’re interested in learning more about Dermaplaning, call us today to schedule your appointment.